Sometimes an egg gets coated in calcium. It looks very white and powdery on the surface of the shell. 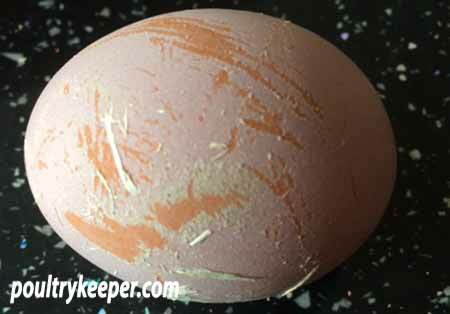 Sometimes the egg can look a pinkish colour. Calcium coated eggs are usually caused by the egg staying in the shell gland for too long. Young hens that are stressed in some way can be susceptible to this when they are ready to lay because they will hold on to the egg for too long. A calcium coated egg. Photo courtesy of Michaela Whiddington. 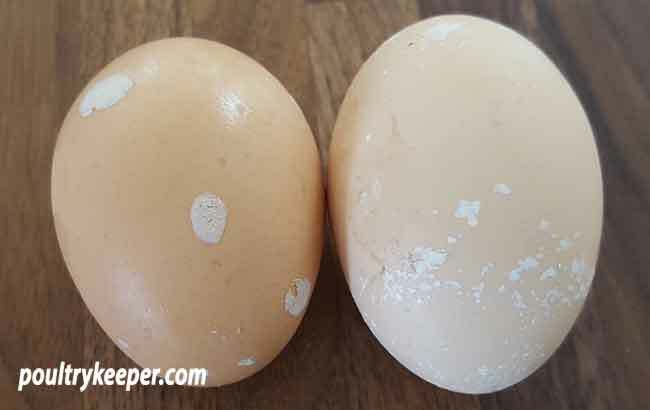 Calcium coated eggs are not normally anything to worry about and usually just appear the once from a hen with her eggs going back to normal afterwards. Spots of Calcium on eggs. Photo courtesy of Barbara Jo Brooks.